Usually I'm putting my thinking cap on for readers of real living, but today the problem is mine. I wrote about it here. 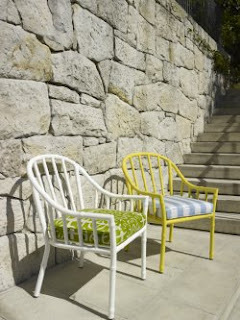 I bought these great chairs the other weekend from Robert Plumb and have to decide what colour to get them powdercoated. Do I go for one colour - my preference, probably bright yellow - or four separate colours - white, yellow, orange and dove grey. What do you think? I love the idea of four different colours. If you had a great fabric in maybe three colours on white and got them coloured so they matched the fabric with one in white. Love these chairs Natalie! I am using them in a job at the moment but I couldn't persuade the client to go for the yellow so please go for the yellow!! Love the yellow. I'm thinking retro Palm Springs with a modern twist! Hope you show us the finished result? Hmm I like the idea of either. But maybe four different colours. Its always nice as guest to have your own identity... it could be a quirky dinner party trick.. I'd say either all yellow or 2 yellow and 2 white. I wouldn't have one in grey if your table is grey. They're fab chairs Natalie! I think the yellow would be great with colorful cushions! Btw: I've been reading your blog silently for a while and I love it. It's such an inspiration to read about various creative people's journey. I'm hoping that one day some of their courage will rub off on me. Wow, thanks everyone. Although I'm not sure I'm any closer to a decision. When I first saw them they were as four colours and that's what I loved about them, so I think I'm leaning towards that. The table has just been undercoated and is going to be painted Porter's Paints Blueberry Ash - it's in the new Jamie Durie colour range. The yellow and orange are bright, bright colours. The grey is a very pale dove grey and the white is, well, white. I also loved that in the showroom all the fabrics were different too. So many choices! Every one of them should have that nice yellow color. Very nice! I love the idea of four different colours, and the colours you've picked will look fantastic, particularly with different cushions. I wish I had them in my house! Yep, definitely leaning more towards four colours now.